We are so excited to share a new visualization, developed by Sarah Campbell and Zheng-yan Yu as part of Professor Cody Dunne’s Special Topics in Data Visualization course. The original queried data listed the in-text element values as one string for each text, with separators in between. We parsed the data so there existed a row for each combination of text and in-text element value; if a text included 10 person names, there would be one line for each name. We then manually aggregated values that were common, like Catholic Church and Catholike Church. These aggregations were based on sense and were not completed for the entirety of the data, but were completed enough in order to truly show the most frequent in-text element values. 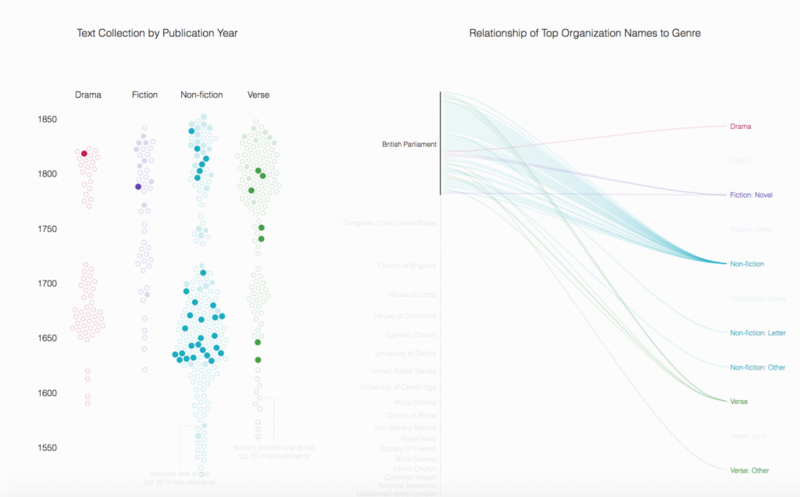 We visualized the top 20 values for each in-text element and their relationship to texts they reside in. We hope that you enjoy experimenting with this prototype!